1. There can be little doubt that the long-awaited judgment of the Court of Justice in the Achmea case delivered on 6 March (Case C-284/16, Slovak Republik v. Achmea BV) gives the last word on the (even longer) debated issue relating to the (in)compatibility of intra-EU investment bilateral investment treaties (BITs) with the EU legal order. In particular, in sharp contrast with the Opinion of AG Wathelet, the Court does not hesitate to state that an arbitration tribunal established under a BIT between two Member States «call[s] into question not only the principle of mutual trust between Member States but also the preservation of the particular nature of the law established by the Treaties, ensured by the preliminary ruling procedure provided for in article 267 TFEU, and is not therefore compatible with the principle of sincere cooperation» (para. 58). The judgment is certainly to be welcome, it will have important consequences on the future of the intra-EU investment agenda, and may have some impact also on the extra-EU investment agenda (see infra, § 5). It finally clarifies a series of important legal questions which had often been raised in the last decade before investment arbitration tribunals seized under relevant intra-EU BITs or under the Energy Charter Treaty, that probably lacked an adequate EU law perspective (see for example, Charanne B.V. and Construction Investments S.A.R.L. v. Spain; Eastern Sugar B.V. v. Czech Republic; Oostergetel and Teodora Laurentius v. Slovak Republic; Saluka Investment Czech Republic; ADC Affiliate Ltd vs. Republic of Hungary; AES Summit Generation Ltd and AES-Tisza Erömü Kft v Republic of Hungary; Electrabel S.A. (Belgium) v. Republic of Hungary). 2. The facts of the case are probably known, since the dispute between Achmea BV (former Eureko), based in the Netherlands, and the Slovak Republic dates back to 2008; in this year the Dutch investor, operating in the insurance sector, started arbitration proceedings against the Slovak Republic pursuant to Art. 8 of the BIT between the defendant State and the Netherlands. Eureko claimed damages for alleged indirect expropriation arising from a change in the Slovakian legislation, which had repealed the previously existing regime liberalizing the insurance market. In those arbitration proceedings the Slovak Republic raised the so called “intra-EU jurisdictional objection”, arguing that, as a result of its accession to the European Union, recourse to an arbitral tribunal provided for in Article 8(2) of the BIT was incompatible with EU law. By an interlocutory award dated 26 October 2010 (Eureko v. Slovak Republic), the arbitral tribunal dismissed the objection. In the first place, it held that arbitration clauses in BITs are different from inter-state dispute settlement mechanisms, such as those challenged under Art. 344 TFEU in Mox Plant (Case C-459/03, Commission v. Ireland); thus, according to the Tribunal, no provision existed under European Union law preventing the resort to intra-EU investment arbitration. In the second place, after excluding that Articles 30 and 59 of the Vienna Convention on the Law of Treaties (VCLT) may invalidate the BIT in question, in particular as to its dispute settlement mechanism, because of the entry into force of the 2003 treaty of accession to the EU of Slovakia (and other nine new Member States), the Tribunal denied also that the CJEU enjoys any ‘monopoly’ in the interpretation of EU law, since this law is daily applied by national courts and arbitrators. Such an interlocutory award was challenged before German courts, albeit unsuccessfully. The final award was delivered on 7 December 2012 and ordered the Slovak Republic to pay Achmea damages for breach of BIT obligations. Thereafter, the Slovak Republic brought an action to have the final award reversed before the regional court of Frankfurt am Main, i.e. the seat of arbitration. It maintained that both the final award granting damages to the claimants and the BIT itself were contrary to public policy, in particular as they infringed several provision of EU law: those on free movement of capital (Articles 267 and 344 TFEU), and the principle of non-discrimination set forth in Article 18 TFEU. This court dismissed the action and the Slovak Republic appealed its judgment before the German Bundesgerichtshof. As a judge of last instance, it referred a preliminary ruling to the CJEU on the abovementioned legal issues. Indeed, the Bundesgerichtshof appeared not to be persuaded by the arguments raised by the Slovak Republic (CJEU, Achmea, paras. 14-22). Nevertheless, it recognized the importance of the matter, due consideration being also taken to the considerable number of intra-EU BITs, and decided to stay its proceedings and refer the question to the CJEU. 3. The judgment tackles all the main points of law that are instrumental to assess the overall compatibility of intra-EU BITs with the specific EU legal characteristics, such as allocation of powers, primacy, direct effects, general principles of EU law and principle of mutual trust, as well as the principle of autonomy of the EU legal system. The CJEU is adamant in restating that the functioning and safeguard of all of the above is ensured and preserved by national courts in cooperation with the CJEU. In this regard, it refers in particular to Articles 4(3) and 19 TEU, in conjunction with Articles 344 and 267 TFEU, which shape the EU constitutional order (see g. Case C‑64/16, Associação Sindical dos Juízes Portugueses, para. 33; Opinion 2/13 on the accession of the EU to the ECHR, paras. 174 ff. ; Opinion 1/09 on the agreement creating a unified patent litigation system). The Court then addresses whether (i) Art. 344 TFEU applies in case of intra-EU investment tribunals; (ii) investments tribunals can be considered part of the judicial system of the Union and, failing this; (iii) the ex post control of the award by national courts is an adequate tool to ensure consistency of an arbitral award with EU law. As to the issue sub (i), it should be recalled that Art. 344 TFEU binds Member States not to submit «a dispute concerning the interpretation or application of the Treaties» to any method of settlement other than those provided by the Treaties. In its opinion (see para. 138 ff. ), AG Wathelet casts in doubt that Art. 344 TFEU would apply in case of disputes involving investors, based on the assumption that such a provision would only apply in case of disputes among Member States or between Member States and the EU. However, the Court does not follow the AG’s suggestion, and takes a more convincing and rigorous approach aimed at establishing whether investment tribunals are liable to interpret and apply EU law to the dispute they are called to resolve. In this regard, it was held that EU law is indeed part of the «law in force of the contracting party concerned» as well as of «other relevant agreements between contracting parties». Therefore, it constitutes one of the sources of law expressly recalled by Article 8 of the concerned BIT for the settlement of investment disputes. Thus, no doubt that tribunals established under such intra-EU BITs can have an impact on the application of Art. 344 TFEU. Subsequently, it was necessary to ascertain if, due to the way they are structured, investment tribunals can be classified as “court or tribunal of the Member State” within the meaning of Art. 267 TFEU. Should this be the case, they would simply integrate the EU judicial system, having the capacity to refer preliminary rulings to the CJEU. Both AG Wathelet and some authors (see e.g. Basedow) advocated that referrals for preliminary rulings to the CJEU by investment tribunals established under BITs concluded by Member States should be admitted by the CJEU in view of their different nature vis-à-vis commercial arbitral tribunals. This argument is based, inter alia, on their legal origin (being established by an international treaty), their permanent (though optional) nature and the compulsory jurisdiction they ensure. However, the Court does not uphold this view, since investment tribunals lack any real connection with the judicial systems of the Member States (para. 48; see also Case C‑196/09, Miles and Others, para. 41). In fact, there is little doubt that the raison d’être of these arbitral tribunals is to allow private investors to escape domestic courts and national judicial systems. Failing the direct integration of these tribunals within the EU judicial system, the Court addresses the issue of the ex post control on their award by national courts. In accordance with Art. 19 TEU, such review by national courts would in principle ensure that a question of EU law addressed by the Tribunal could be submitted to the CJEU and therefore brought within the EU system of judicial protection. Precedents in this regard relate to commercial arbitration tribunals. In such cases, the Court has generally considered acceptable the limited grounds for setting aside awards set forth by national law, provided that effet utile of mandatory EU law is ensured (Case C-168/05, Mostaza Claro, para. 35; Case C-126/97, Eco Swiss, para. 37). Yet, in the present case, the Court distinguishes investment tribunals from commercial tribunals, based on the assumption that «while the latter originate in the freely expressed wishes of the parties, the former derive from a treaty by which Member States agree to remove from the jurisdiction of their own courts, and hence from the system of judicial remedies which the second subparagraph of Art. 19(1) TEU requires them to establish in the fields covered by EU law… disputes which may concern the application or interpretation of EU law» (para. 55). The reasoning appears fully consistent with the already mentioned obligation Member States have under Art. 344 TFEU, in so far as investment tribunals are considered capable to apply EU law. At the same time, we have already seen that, according to the Court, the nature of such tribunals is relevant for excluding them from the EU judicial system. However, the very narrow possibility given to national courts to review investment arbitrations, under the ICSID regime, may have persuaded the Court that the risk of running afoul of Art. 344 TFEU obligation and of the autonomy of the EU legal order (i.e. compliance by the same Member State with obligations stemming from Arts. 19 TEU and 267 TFEU) was too high to treat investment arbitral tribunals like commercial ones. 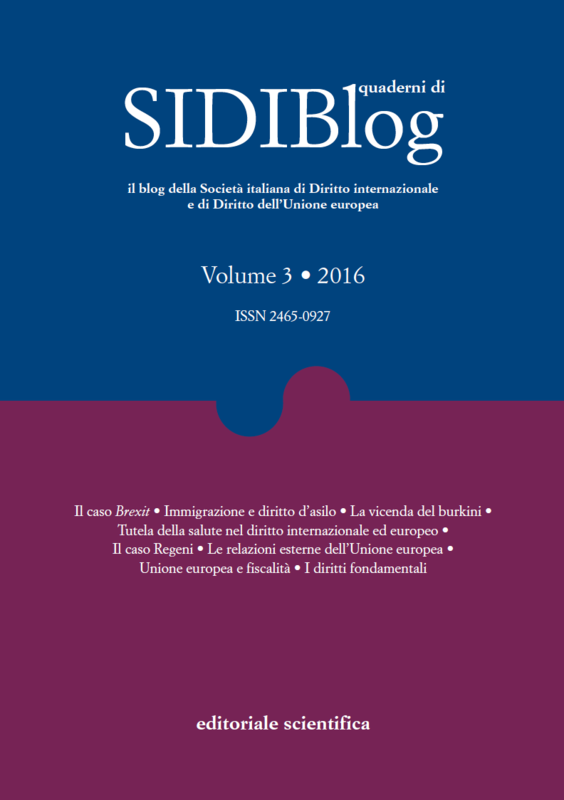 Sure, not all investment disputes can be decided under the ICSID settlement regime; and yet, on the one hand all but one Member State (Poland) are parties to ICSID; on the other hand, it would be certainly complicated to draw a distinction on the kind of settlement dispute used within an intra-EU BIT – with a view to excluding only ICSID-governed ISDS – as a precondition to consider it admissible or not under EU law. 4. The arguments set forth by the Court with regard to the incompatibility of intra-EU BITs and ISDS with the special characteristics of EU law, including in particular «the principle of mutual trust among the Member States… and … the principle of sincere cooperation», are convincing and welcome. As we have already argued elsewhere (Munari, Cellerino, p. 125), a system of investment dispute resolution established at the inter-state level, and shaped to a great extent as an exclusive and preferential alternative to the EU judicial system under Arts. 19 TEU and 267 TFEU, cannot and should not be maintained within the internal market, because it jeopardizes the uniform and consistent application of internal market rules applying to foreign direct investments (see also Micula et al. v. Commission). This said, there is no doubt that, at last, the Achmea judgment outlaws intra-EU BITs from the EU legal order. This result was reached with the most typical tool available to the Court, i.e. a request for preliminary ruling on a domestic case on the interpretation and application of EU law concerning the judicial review of an investment arbitration award. Anyway, it is long overdue from the substantive legal viewpoint. In our view (and, fortunately, in the Court’s view), upon the adhesion to the Union, and the combined enjoyment of the fundamental freedoms available to EU firms, it is simply inconceivable to have “special” regimes for them depending on whether they are located or not in the host State of their investment. Especially if one considers that, in the first place, EU fundamental freedoms guarantee a virtually unlimited investments regime within the EU (and even beyond, as we shall point out later); and secondly, that freedom of establishment easily allows a domestic investor to establish in another Member State, obtain the status of ‘foreign’ investor and use such a status to seek (additional and undue) protection under an existing intra-EU BIT. Besides, this is exactly what may have occurred in the celebrated Micula case, where one could seriously cast doubts on the investor’s Rumanian nationality, at least with regard to its ultimate beneficial owners. In this respect, such ISDS raises problems also vis-à-vis the principle of non-discrimination on grounds of nationality set forth in Art. 18 TFEU. It is our firm belief that fundamental freedoms grant any EU-labeled undertaking willing to invest in the Union the most advanced and open regime world-wide. It would be totally unjust and disproportionate to entitle such undertaking to claim also the additional potential protection which can be sought using the traditional tools of a BIT, whose rationale and legal setting is at odds with the EU legal system. In contrast with the usual BIT legal environment, the EU is a solid and harmonized – and often uniform – regime, encompassing virtually all economic aspects of entrepreneurial activities (with the exception of taxation, but hopefully also this last inconsistency will be sooner or later fixed). It further integrates all economic policies with one another (e.g. environmental protection, energy policies, social rights, and so on), as it is normal for comprehensive and autonomous legal systems like the EU. In such a situation, an additional protection claimed by an EU firm against a Member State and based on an intra-EU BIT cannot be allowed, for the same reason why, as the proverb says, one cannot eat his cake and have it too. 5. The judgment will certainly have relevant implications in different areas. In the first place, it will probably doom all investment disputes currently pending before arbitrators that are bound to apply EU law as part of the sources of law applicable to the dispute under the relevant intra-EU BITs. Especially in the case in which the award is in favor of the private investor, it is hard to believe that the State would not challenge it before the competent national courts and ask them to apply the Achmea ruling to set aside the award. Secondly, compelling reasons of legal certainty should finally persuade the still reluctant governments of some Member States to take quick and clear steps in order to terminate, either unilaterally or through a coordinated process at the EU level, existing intra-EU BITs. This step had been requested by the Commission more than a decade ago. And only some Member States (Italy, Ireland, and recently Poland and Denmark) had followed this request and decided to withdraw from existing BITs with other Member States. If this was not the case, now that the Achmea judgment is part of EU law and binds all Member States, one may also consider whether further inaction in this direction by them would not be tantamount to a breach of EU law, with the possibility of an infringement procedure under Art. 258 TFEU. The Achmea judgment might also chill the proposals made by a group of Member States to establish a new system of ISDS common to all Member States replacing existing intra EU BITs (see Non-paper from Austria, Finland, France, Germany and the Netherlands, presented on April 2016 to the Trade Policy Committee of the Council). Furthermore, the Commission seems to pursue another type of initiative to fill the legal vacuum that would be left by the phasing-out of intra-EU BITs. In its Consultation Document – Prevention and amicable resolution of disputes between investors and public authorities within the single market, the Commission had proposed EU-driven initiatives aimed at creating an investment-friendly, uniform and effective intra-EU investment area, ensuring a more effective application of existing EU investment law, based on the application of free movement of capital and freedom of establishment. At present, the overall relevance of these initiatives seems however much reduced. In fact, if priorities in this area have to be set, our impression is that the EU should now concentrate on “true” foreign investments in the EU. This topic has become more and more urgent especially after an overall reflection on this matter which not only encompasses the EU, but more generally international trade. To this end, the Proposal for a Regulation of the European Parliament and of the Council establishing a framework for screening of foreign direct investments into the European Union, which the Commission presented on September 13, 2017, and which has already received a substantial positive reaction by the EESC-European Economic and Social Committee (see the Opinion delivered on March 28, 2018), should advance in the legislative procedure to allow the EU a fundamental tool for screening foreign investments and give Member States a common and uniform legal framework, to use in case the need of defending paramount interests of the EU and of the Member States arises. Needless to say, the judgment will have an impact also on other pending matters concerning settlement of disputes in investor-State claims: Achmea will influence the equally awaited – and to some extent parallel – CJEU opinion on the compatibility of the Investment Court System (ics) negotiated in CETA with the Treaties, requested by Belgium on 6 September 2017. This, in turn, will further determine the chances of success, or the way ahead, for another important initiative promoted by the European Commission, namely the negotiation of a multilateral Convention establishing a multilateral court for the settlement of investment disputes: indeed this idea was launched before Achmea and in the context of negotiations concerning in particular investments agreements concluded by the EU with third Countries. Therefore, some further aspects regarding the relationship between EU law and international courts and tribunals will also have to be taken into consideration. In any case, intra-EU investments should be outside the scope of this initiative, as they should no longer be entitled to have special dispute settlement regimes compared to any other litigation among a member State and any undertaking established in the territory of the Union. In conclusion, the Achmea judgment certainly represents the end of intra-EU BITs; but this is just the beginning of another story, still to be written, in the realm of foreign investments governance at the EU and the international level. Diretta streaming: "Diritto internazionale (o globale?) e relazioni internazionali, tra egemonia e unilateralismo"